The ST2011-3 Dual Storage Server has Dual E5-2600 v4 Series processors (up to 44 cores and 88 threads) and supports up to 768GB of DDR4 RAM. This 3U Rack Server has 16 hot swap hard drive bays, redundant power supplies, and a hardware LSI 3108 RAID Controller for mission-critical reliability for business applications. 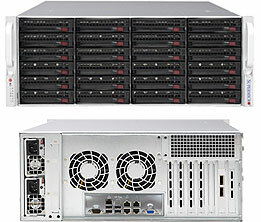 The ST2011-3 Server is designed for dense computational and storage requirements and is perfect for file storage, web hosting, and other high-data usage applications.